I recently saw this great clip featuring French player Francois Trinh-Duc’s doubly-clever move to set up a try for his team mates. What’s on play here is a sound knowledge of the laws of the game not just by Trinh-Duc, but by his team mates as well. 2. To ensure this happens, as it’s probably unclear to Trinh-Duc if the ball is truly going to go out, he straddles the touch line BEFORE making his catch. Simply put, he did not carry or knock the ball out. By having at least one foot in touch when he caught the ball, he was already out, and as such made the ball that was kicked by his opponent out. There are a lot of situations like this that can be very confusing even to veterans of the game, largely because we rarely see them. There’s a great document from Australia that outlines pretty much every possibility, including both feet in, one in and one out, and while jumping in the air. It can be found by clicking THIS LINK. 3. Knowing that a quick throw is possible before the lineout is set, Trinh-Duc runs forward to where the assistant ref marks the spot that the lineout will occur. Up until this season, the quick throw could only take place from the spot the ball crossed the touchline or further back toward one’s own goal line. This year, as can be seen in this video, the quick throw can take place at the ‘line of touch’ – or where the lineout will occur when kicked out on the full. Explanations and further examples from the IRB Laws site can be found HERE and HERE. 4. He makes a quick throw – which must go 5m – to a team mate, who sets up another for the score. Trinh-Duc could have taken the quick throw from where the ball went out. But knowing that it’s now possible to take the throw from where the lineout will occur, he took the opportunity to run it forward and gain some free metres (as well as get behind most of the opposing players who’d chased the kick). This can be a bit confusing if you’re new to quick throw-ins, but the new Law trial actually makes more sense than the way it was before because the options then were take a quick throw down field or wait and have a proper lineout upfield. Now players have the option of making a quick throw anywhere from where the lineout should occur all the way back to one’s own goal line. Quick throw can occur anywhere from kicker in blue back to the goal line. This is entirely possible at any level, but players wanting to make a quick throw must use the same ball and it has to be taken by the person who fetches the ball (not chucked to someone else who takes the quick throw). Catching the ball cleanly before this happens makes setting up quick throws that much easier. Hopefully refs at your level are aware of these things as well! In the previous article, I discussed how the defending team should ‘attack’ so as to take away the time and space available to the team in possession. The issues discussed provide a focus to the shape of the defensive line as well as a sense of urgency. The line must come up fast, but together so as not to ‘shoot’ up or leave ‘doglegs’ that clever attackers will angle for. I also stressed that while the defensive line should be ‘flat’, it should not be absolutely ‘flat’ so that there is at least small degree of depth to the line to prevent kicks over the top, to be better placed to cover line breaks, and to be able to launch counter attacks more quickly. In this final article on defensive structure and execution, I will add something for those teams that are already doing this well but that could use greater focus with regard to individual responsibilities. Why even greater focus? One of the great factors in winning the Attack v Defence battle is the quest to have more of your players on their feet in a given phase than they do. Referencing back to playing to the principles of the game article, one could consider the ruck a ‘failure’ to achieve all of those (arguably apart from continuity if the ball has emerged on the attacking side) and as such the defending team should NOT look at the next phase as simply preventing the other team from scoring, but see it as an OPPORTUNITY to win the ball back. Well structured and continuous attack is what wins games in rugby, but organised and determined defence will win us the ball back and allow us to then enjoy possession. So I tell my players that not every ruck needs to be contested – the tackler and one person to have a go is often all that needs to happen when the team in possession has ample support present. The attacking team usually sends double that into contact – even at the highest level! – to ensure possession and have numbers in the tackle contest to resist any sort of counter ruck. If one does the math, we should then have more players in defence than they have to attack and here is where we should determinedly aim to win the ball back even before a tackle takes place! 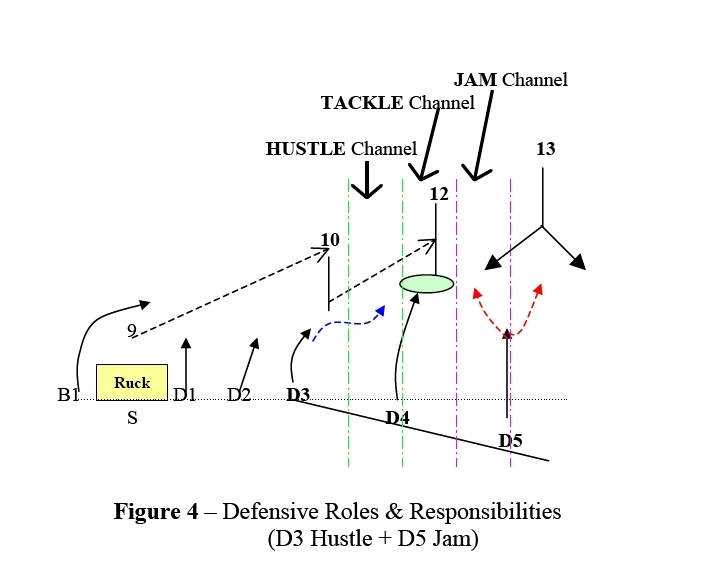 Borrowing again from the excellent NSW Rugby document “Effective Team Defence” from their Coach Education Series (2004), the following diagram lays out specific roles for those three players in front of the ball (at least) who are crucial to the integrity of our defensive line. 1. D3-D4-D5 are going to ‘attack’ as a unified defensive wall providing no clear holes to the attacking team. Obviously their roles, and the roles of other players in the line will change if the ball moves, but for this explanation, let’s assume that 12 is going to take the ball to the line. 2. D3 is in what the Waratahs call(ed) the Hustle Channel. By maintaining his line speed with the rest of his D4 and D5 team mates, he’s likely to force the attacking 10 to pass the ball on. He needs to maintain this pressure at least until the ball is passed again so there’s no chance a pass inside can breach the defensive line. In ‘hustling’ the ball away, he forces the attack wider, hopefully flatter (i.e. with less time and space in which to attack as they wish), and away from their source of support. One of my biggest pet hates is players who run sideways with the ball as they’re effectively doing this for the defence! Ideally, the defenders will each become the ‘hustling’ player within a flat defensive wall, forcing the ball / players to be shipped wide and eventually into touch. This is our three-player defensive wall in front of the ball that has to maintain its shape until the tackle is engaged. But as the ball had started from a ruck fully 10m away from where it now is, the defending team will want to make this the tackle they dominate and from which they regain the ball. 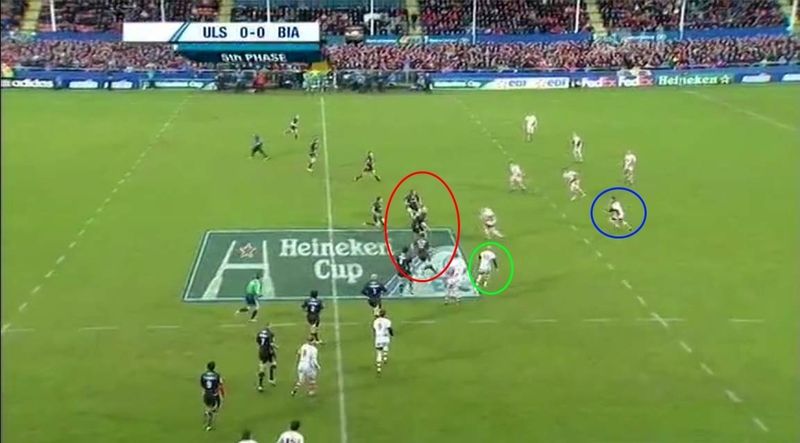 With immediate threats not present, and ‘Hustling’ and ‘Jamming’ defenders on both sides, the two such players in the red circle should be able to step in and try a double tackle and rip the ball or jackal over the ball once the tackle is made or establish a quick ruck to win the ball. This is the sort of decision that individual players must make for themselves in the split second that contact is initiated. I like to train this, at a basic level, with a 1(+2) v 4 drill whereby an attacker has a go at 4 defenders in a confined space, with two late support players. The defenders must take away the space while maintaining their shape and communicate / decide on their roles as contact is initiated and the tackle contest unfolds. Then, hopefully, they can apply this level of trust, discipline, and communication into a full game situation, still at training so we can work on this concept in a more realistic context and make corrections as needed. This is a rare occasion where I won’t spend a lot of time typing, but I wanted to share an excellent analysis from former Wallaby coach Bob Dwyer on Ben Alexander’s try against the Boks at the weekend. While the speedy and clever prop (how’s that for a double contradiction to stereotype!?) might have scored the five-pointer, this was definitely a team try! Simply put, the Wallabies struck fast and determinedly at a disorganised Springbok team that’d just turned over the ball. They focused (funnelled, is a great description) their attack down a narrow channel, drawing Boks in, and then they moved it wide through the hands away from the largest concentration of defenders. That’s how you launch a counter attack! Have a look at the Green and Gold Rugby Blog for Mr. Dwyer’s further analysis of this wonderful counter attacking team try.